Dieter Reinisch interviews Brian Kenna, the new chairperson of Saoradh. Ard-Fheis 2018 in Dundalk, Co Louth. At their third Ard-Fheis (AGM) on 17/18 November in Dundalk, Co Louth, the Irish republican party Saoradh elected a new chairperson. Brian Kenna from Dublin succeeded Davy Jordan from Co Tyrone who chaired the party since its formation two years ago. Kenna, such as Jordan, is a former republican prisoner. 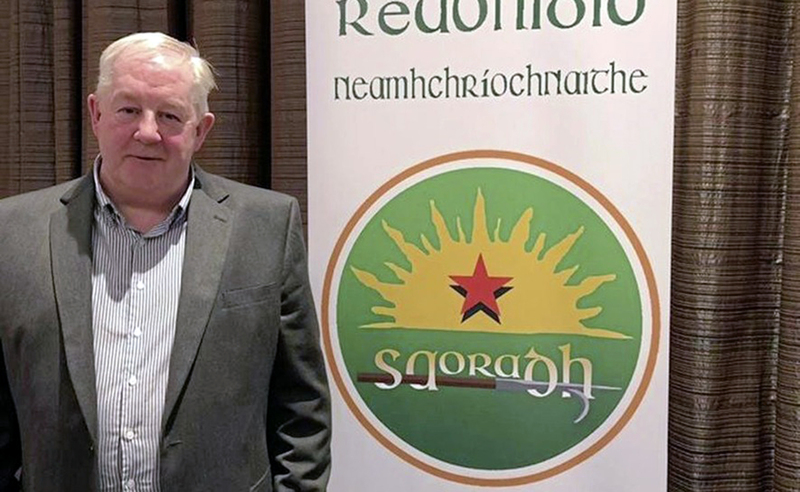 In this interview, Kenna speaks, among other issues, about the development of Saoradh in the past two years, its future, Brexit, the relationship with the IRPWA, the Dublin drug gangs feud, and how he became disillusioned with Sinn Féin. Saoradh is the youngest and, together with the IRSP, arguably the most visible Irish republican organisation opposed to the Good Friday Agreement settlement. 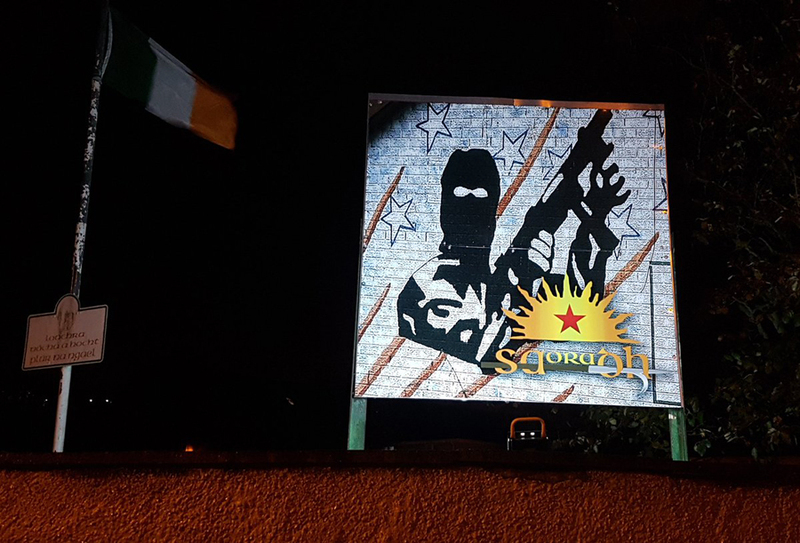 The formation of Saoradh needs to be understood as a direct result of the merger of the various paramilitary organisation to form the so-called “New IRA” in summer 2012. The election of Kenna from Dublin indicates a shift in the party policy. With Kenna as chairperson and Ger Deveraux as general secretary, the party which has been seen as a largely Northern Ireland based movement, is now headed by two Dublin men while the vice chairperson remains Mandy Duffy from Lurgan, Co Armagh; the new national PRO is Paddy Gallagher from Derry. Kenna, 57, is originally from north Dublin but lives in Crumlin. He became involved with Irish republicanism in the 1980s, joining Sinn Féin and the Dublin-based Concerned Families Against Drugs. In 1990, he was first arrested, sentenced and spent the following five years in Portlaoise Prison as a member of the Provisional IRA. He was released together with a group of P-IRA prisoners in 1995. This was a goodwill sign of the Republic of Ireland government during the negotiations that led to the signing of the Good Friday Agreement in 1998. Following his release, Kenna appeared in newspapers as a spokesperson of the prisoners. He remained in Sinn Féin after the signing of the Good Friday Agreement and stood in local elections as their candidate. However, critically of the peace process since his release, he left Sinn Féin and became active in the IRPWA. In recent years, he was arrested again and spent another 16 months as a republican prisoner in Portlaoise until he was eventually released in May 2018. Kenna worked as a social worker in the field of rehabilitation and integration with the “Drug Addiction Service Ireland” and served as CEO of the “Inner City Regeneration Project”. I met Kenna around lunchtime in a Dublin inner city hotel. I was a few minutes early, but Kenna was already there. When I arrived, he was reading through a small pile of political documents that were lying on the table in front of him, on top of it the printed copy of the new Saoradh policy “Brexit in the context of Ireland”. Kenna is obviously well-prepared for the interview. Against any rules of behaviour in interview settings, Kenna, the narrator, insists to pay for the tea of the interviewer. I try to change his mind but miserably fail in doing so. As soon as tea is served he starts talking about Brexit. The proposed Brexit deal has not yet been published. Kenna is well-versed on Brexit and British politics. He closely follows the developments, knows all the morning news and has a strong opinion on Brexit despite insisting that he, as an Irish republican, does not care what Theresa May and the British government are doing. He is obviously dishonest with me on that matter, for no one who would be as well-informed as he can claim not having an interest in the topic. Our conversation is lively and interesting. I suspect it might have gone on for the whole afternoon, but I came for an interview and I had to reach my train to Belfast for a number of appointments there. Kenna changes the topic, he talks about an upcoming protest against the Special Criminal Court in Dublin and the need for a broad campaign against the SCC. I struggle to interrupt him. While the conversation remains lively, the recording device is not on. Yet, eventually, I manage, and the interview starts. DR: It’s only a couple of days since you were elected chairperson at the recent Saoradh Ard-Fheis. How does it feel? BK: It is a huge task. I understand that Saoradh is a vibrant, revolutionary, socialist republican organisation. It is very much under pressure from the Crown Forces in the 6 Counties and the political police in the 26 Counties. We are fully intent to become a grown-up party, becoming stronger, more vibrant, more representative of the republican perspective. Because of that, the establishment is fearful of any attack on the status quo. So, it is a huge task but one that I am looking forward to. DR: Most people who are familiar with your name would solely know your background as a republican prisoner in Portlaoise, but they would know little about your politics. Why are you the right person for this job? BK: I would have said this at the Ard-Fheis that when I looked around, I saw many faces of people who would have a huge political credential to lead the party. We tried to avoid any cult of personality within Saoradh. We don’t want to make any of these mistakes that other organisations made where you had a leader who stayed on for 10, 15, 20, 25 years because it is inward taking, it can be elitist, it can be a clique. We encourage a grassroots-up participation in party structure and consistency of that we were looking to change the leadership this year. The outgoing chairperson Davy Jordan had done a tremendous job in being its first chairperson, giving the party a direction and stabilising the organisation. We felt that it was time to bring in someone new and it was felt that, because I am from the South, from Dublin in particular, there is huge potential in Dublin and in the South of Ireland. I suppose consistent with grassroots involvement and leadership, people are looking for a change. It could have been anyone in the party. I was picked but it obviously could have been anyone. We wouldn’t be fixated on a strong and dynamic leader, we want to make sure that there will be as much participation from a grassroots level as possible in every level of the organisation. DR: How did it happen that you became a republican activist in the first place? BK: My family was deep in republicanism. Five of my uncles were interned in the Curragh military camp during the Second World War. They were arrested and interned without trial for the duration of the Second World War and longer because they were Irish republicans and they were seen to be a threat because England’s difficulties are always Ireland’s opportunities. So they rounded up many republicans during the early ’40s and kept them almost to the ’50s, that was my father’s side and his brothers. When I was a teenager, I grew up in Dublin and I got involved in the anti-drugs campaign in Dublin against the scourge of heroin and I was also interested in Irish nationalist politics and so I joined Sinn Féin. I was very active in the anti-drugs movement “Concerned Parents Against Drugs” and in Sinn Féin and, eventually, I found myself in prison in 1990 and I served a 10-year sentence at that time. I remained in Sinn Féin for a couple of years afterwards but then I felt: What has since the Good Friday Agreement happened? Sinn Féin went into Stormont and also accepted the police informers and I felt that I no longer have views consistent with that ideology and I left. I then got involved in the Irish Republican Prisoners’ Welfare Association and I worked on behalf of the Irish republican prisoners. I was then involved in the formation of Saoradh but, unfortunately, I was arrested again, so I could not participate in Saoradh for a year and a half because I was on bail. Some of my conditions were very, very draconian bail conditions. I could not attend any meetings, I could not speak to any people involved in politics, I could not attend any demonstration, I had a curfew and I had to be in at 11 pm every night. I also could not be in the company of anyone who had been in prison before, so I was not involved in the first Ard-Fheis and then I was jailed for 16 months on the word of an assistant Garda commissioner who said he believed that I was a member of an illegal organisation. There was little to no evidence against me. It is the Special Criminal Court, once you go to this court it is very, very hard to come out innocent. I was released in May this year and I got back involved in Saoradh. DR: You were one of those who were released as part of the peace process in the late 1990s and you are quoted as a spokesperson of the prisoners in papers from that time. You later remained active in Sinn Féin. How does a prisoner who gets released during the peace process eventually end up in Saoradh? DR: Let us talk about Saoradh. It is a new party only found two years ago. Why was it formed? BK: Because of the vacuum. There was no organisation credibly active in seeking to bring about Irish reunification that I could see. There was no organisation with people that had the political credibility, a revolutionary experience that could install any confidence in republicans to continue the fight for Irish reunification. Saoradh is absolutely necessary. Once there is an occupation of your country, Irish people have the right to oppose this occupation by whatever means necessary. Saoradh, although it is a new organisation, there are a lot of older republican socialists involved in Saoradh. That doesn’t mean they were all in prison in the past, but they would have consistently opposed imperialism in Ireland right down the years. We have people in their 70s, but we also have éistígí which are a youth wing if Saoradh. So, we have people from their early teens right into their 70s. We have a person in prison at the moment who is 70 years of age, Kevin Hannaway, who would have been involved with Provisional Sinn Féin and the IRA down the years. He is one of the Hooded Men. We have people of that credibility. It is not just a new party. It is a new party with people who have been involved in the anti-imperialist struggle in Ireland. DR: People from other organisations would answer me the same about their organisations. 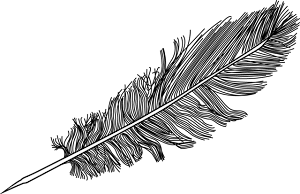 There are several other organisations around, some since 1986, some since 1997. Let me phrase it a bit more provocative: Who needs Saoradh? BK: Those who are intent to removing British influence in our country need Saoradh because no other organisation has this credibility. There are individuals who are strongly socialist, republican and anti-imperialist and I have a lot of time for them. There are small groups of individuals who come together at various different times who come together to oppose issues that arise in Ireland but there does not appear to be any consistency with these groups. So, while I admire other anti-imperialists in Ireland and I wish them well, they stop short of confronting British occupation. DR: Before we talk about the future of Saoradh, let’s talk about its past. I was in Coalisland at the Unfinished Revolution Easter Commemoration in 2016 which was a big success for the organisers but then not all those who were involved in the organisation of this march were not involved in the formation of Saoradh. Then, less than one year into the existence of Saoradh, you witnessed your first split in Belfast. How would you assess the first two years of the existence of Saoradh? Because you mentioned that Davy Jordan was a stabilising factor. What do you mean with that? BK: Saoradh is a new party. There was a war weariness in Ireland because of the long 30-year campaign against British occupation which was dominated mostly by Sinn Féin and the Provisional IRA. But when they moved towards the centre and when they gave up the notion of physically confronting the British occupation of our country, there was a huge war weariness and people drifted away. So, it needed a new organisation for the people to continue the struggle for Irish national self-determination. Davy Jordan would have huge credibility on the ground and he managed to put a shape on Saoradh in its first two years and that was very important. But regarding the splits and all that. You need to consider that it is a new organisation. Any party has a level of personality. People from one area might not have a different ideology but a different idea of the pace of things or the direction things are going, so you will also have a natural fall-off of people from time to time and that can happy at any time in every single organisation. Sinn Féin has lost senior party figures including elected representatives every so often. They would be a very strong, some would say dictatorial organisation. While it is regrettable, it does happen. Just because people leave the party does not mean they give up their aspirations for a United Ireland. We think that some people who leave still have a political ideology that is consistent with ours. We have to accept it. Being involved in a revolutionary republican socialist organisation like Saoradh is very time-consuming. We are trying to bring forward the best and the finest and the most willing and able to continue the fight for Irish freedom. DR: Saoradh held their first manifestations all in the 6 Counties. The first Ard-Fheis was in Newry, then in Derry, all the Unfinished Revolution commemorations were in the 6 Counties, Coalisland, Derry, Belfast and also the most well-known activist come from this area, namely Paul Duffy, Patrick Carthy, Stephen Murney, Dee Fennell, Davy Jordan, they are all from the 6 Counties. Why a Dublin chairperson? BK: Thankfully the people in the 26 Counties stand up and the party has been very conscious of the fact that we encourage people from the 26 Counties to reclaim Republicanism and the struggle for national self-determination. While the major commemorations took place in Coalisland and Derry, over the past two years there have been other commemorations. There was another Easter commemoration in 2016 which took place in Dublin. It was very well supported and surprised the establishment down here. This hastened the 26 Counties administration desire to arrest people. There is a constant flow of people appearing in court. There was also the Wolfe Tone commemoration which had not been a factor of Irish political life for many years. This was restarted by Saoradh two years ago, in 2016. They were well attended and not just by people in the South but the people in the North very much support it to make it a national commemoration. You see an end of this partitionist thinking that it is all 6 County-based. As I said before, it could have been anyone. We had an incredible wealth of people at our Ard-Fheis last week in County Louth. But I was elected, and the general secretary is Ger Deveraux who is also from Dublin. The vice chairperson is Mandy Duffy from Lurgan. So, you have a stronger engagement of people both from the North and the South and our intention was to develop the party in the South. One of the reasons why we know this is happening is because we got ourselves involved in a lot of the political, economic and social issues that affect the people in the 26 Counties. We realised that it is an anti-imperialist struggle that we are involved in and the Dublin government are very capitalist and imperialist in their makeup and unless we bring this notion to people and get them to understand that capitalism is the enemy of the people, we will go nowhere. This is the path we are going now. We see the growth in the South, not because the chairperson is from the South, but the people realise that life for, particularly, the working class will not get any better under a capitalist society. When these people become involved in activism they quickly realise that the partition is a huge hindrance in making our lives better. DR: Will the inclusion of members from the South into the leadership reflect a political change of Saoradh? BK: No, it is not a shift in the power within the organisation. It is an embracement of more people from the South and this has to be welcomed. We are a 32 Counties organisation. We are uniquely placed to harness the collective energy of people from both the 6 Counties and the 26 Counties. We do not see a border, we don’t accept a border, we don’t have a partitionist mindset. It is not strange for us that people from Cork, Kerry, Limerick and Dublin sit in a room with people from the 6 Counties and give directions to the party. With Provisional Sinn Féin, in the earlier years since the 50s and the 60s, you had an organisation that was dominated from the South, Ruairí Ó Brádaigh and Dáithí Ó Conaill and those people. But when the explosion of the conflict happened in the late 60s and early 70s you saw a new leadership emerging including the likes of Gerry Adams and Martin McGuiness and all them. You saw a shift in the power. But for Saoradh, we do not see a shift in the power from the 6 Counties to the 26 Counties. We see the combined Irish people standing up for themselves, but people can read into it what they want to read into it. Nor does it mean that, because the chairperson is from the 26 Counties, we are less militant. We still want to see the last British soldier leaving this country. Everyone in the party in the 26 Counties is steadfast that we should not be governed by Britain, nor should we be governed by an imperialist European Union. It doesn’t matter where the chairperson is from, we are a united party. DR: What are the immediate tasks for Saoradh? BK: The main tasks are consolidating our position, put the question of the partition at the centre stage into Irish politics. Partition hinders the working class to rightfully take ownership of the wealth of the country. The fight against partition and the involvement of imperialism in Ireland is what unites us in our struggle. DR: Saoradh published their Brexit policy documents a few weeks ago. This is the first political document Saoradh has published. Can we expect more policy documents in the future? BK: Yes, very much so. Specifically focusing on Brexit in the context of Ireland it has, currently and will have in the future, a huge impact on Irish life. In compiling this document, we travelled wide around the country and seeking an opinion from people, getting their approval for writing this document and explaining to them why we are moving into this direction and in doing so we got the feeling of people right across the country. Basically, what we find is that people are affected in social and economic ways the same way they are in Belfast as they are in Cork, the same in Dublin as they are in Galway. We realised that we need to develop policies on a whole range of issues. At our recent Ard-Fheis, we decided to hold conferences in the early part of 2019 on a range of issues including homelessness, housing, drugs, the legalisation and decriminalisation of drugs, drug treatment and rehabilitation and a whole range of social issues. We have a desire and a need to produce policies and explain why imperialism is holding this country back. So, I would that by mid-2019 we should have a number of printed policies in place. DR: Can you sum up your Brexit position? BK: We say that: Brexit in the context of Ireland highlights the failure to address the root cause of conflict between Britain and Ireland, that is partition and the usurpation of Irish national sovereignty. We also say that addressing this issue by debating a hard or a soft border misses the point because it does not address the cause of conflict. Our main task is to highlight the root cause of the conflict and that is partition and that may entail a direct challenge to whatever mechanisms that may be implemented as a result of Brexit. For instance, a hard border will increase hardship on people whether this is social life or economic life. It will impact once you put a physical infrastructure on the so-called border which is a British border. This will reawaken people that Britain still rules the 6 Counties of Ireland and this is going to lead to renewed conflict. Physical infrastructure will be resisted. There is no doubt about that. What we say is that Britain out of Ireland and Ireland out of the EU makes political, economic and strategical sense. Britain has dug a hole for itself with this Brexit policy. I believe that the capitalist people in England were used against the people in the north of England. The people who hold the power are all in the south of England. So, the people reacted in a xenophobic way. They say its immigration and people coming into their country and stealing their jobs. It was the Tory policy that lost the people their jobs and gave people in the north of England a substandard life and fewer opportunities for work, housing and other services. It has nothing to do with immigration. It was the mismanagement of the British economy that causes the mindset. People like Nigel Farage and Boris Johnston acted as agent provocateurs. They have the British bulldog attitude. Because of that arrogant attitude they cannot see the wood for the trees, they are stuck in it. I personally believe that Theresa May would love to say that they made a mistake. If they had a new vote tomorrow, they will reject Brexit, but they are too arrogant to admit that. That is fine, that is their decision, I have no desire to influence the thinking of the British people. They are stuck with Brexit and they have no way out, so it is Ireland’s opportunity. Saoradh intents wholeheartedly to exploit this opportunity. DR: Are you advocating a second referendum? BK: No, from a British perspective I imagine that most people will say: “Let’s have another referendum.” If you look at the survey, more than 50% plus people would go for it but I am not advocating it. It is not my concern; the British government can do whatever they want to do. Jeremy Corbyn is just sitting back, doing nothing and waiting that the government will implode so he can walk in. He is trying to be populist even among his own so-called left support. But he is also not prepared to grasp it and say: “We were wrong, we want a second referendum.” I am not advocating it, it is their choice, but they are too arrogant to admit it. If they would have a second referendum tomorrow, for us it would make no difference because the British would still illegally be occupying the 6 Counties of Ireland. And it doesn’t change the position of Saoradh towards the EU. We want to leave the EU. We want to prepare a situation when the whole country will have the opportunity to make a decision what kind of government we want to have. I believe it should be a socialist government and this government will then be in a position to negotiate with other governments around the world and stand as a united nation and enter any agreement they all agree to. But that cannot come about if you have an imperialist imposed state in the 6 Counties and a neo-colonial state in the 26 Counties. Until the Irish people can vote as a whole what government they want, I have no interest in what the British do. DR: What if it comes to a second referendum, how would Saoradh position itself in it? BK: We have no interest in it. It is a British referendum. We would leave the EU, but I believe that the British people voted to leave the EU for the wrong reasons. DR: Will Brexit increase political violence in Ireland? BK: I think it is inevitable. It depends what kind of deal will happen but if there is a no-deal, I know it is very fluid and it is changing day-by-day, there is a requirement that a physical hard border is established and this physical hard border is manned by British security forces, that increases the opportunity and the motivation for violence in that area and this will most likely happen. DR: I remember Paul Duffy said the same in the BBC documentary with Peter Taylor. Why would security forces along the border increase the likelihood of attacks? There are British security forces all over Northern Ireland, why would border posts make any difference? BK: Because there will be a physical manifestation of British rule in Ireland. People will see it on a daily basis. People will be subjected to sectarian harassments and abuse at border checkpoints. That is not a feature for everyday life of ordinary people. It is a feature of life for republicans. But republicans are at present in a minority. But the border will, as it was in the past, a feature of life for ordinary citizens, North and South. People who are travelling and people could have land on this side of the South Armagh border and they can also have land on the other side and it will affect their daily business, like moving the cattle, or just going shopping or to the bank. They will find themselves in long queues at border checkpoints with personal checks, cars being searched, buses stopped, belongings searched, and sectarian comments being made, and threats being issued. All these things happened in the past. As that becomes a normal feature of Irish life, people will naturally become more emotive and react to it and this will reignite the notion that this is an artificial border enforced by a foreign occupation army. If we go back to the late 80s when Aidan McAnespie was shot dead as he crossed from Aughnacloy, County Tyrone, into Monaghan and he went through the border checkpoint there. He was a young GAA footballer and that would have been a normal thing for him to do going to football training. And then when he had a match on a Sunday, he physically had to walk a couple of hundred yards from the occupied 6 Counties to the 26 Counties. 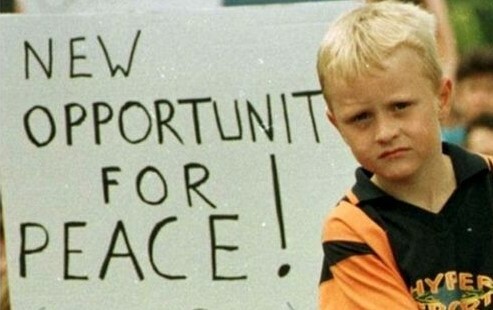 On a regular basis like many young people of his age, he would have been subjected to racist abuse, sectarian abuse, threats of violence, harassment. On the same day, he was shot dead, it was said that he got the same level of abuse. He was shot from the border post in the back and died. That was just an extreme version of what was going on for people of all ages. And this will happen again because it is unavoidable, and it will awaken nationalism again in Ireland. The British presence will be resisted, it just follows naturally. DR: In the last couple of days you heard a number of comments by Loyalist figures like Jamie Bryson, calling for mobilisations against the Brexit deal that is on the table. A situation similar to the Flags protests a few years ago might occur. How will Saoradh react to a Loyalist backlash to Brexit? BK: As republicans had to do it in the past. Republicans always defended their areas against British sponsored Loyalist death squads. Unfortunately for loyalists, there is an area of schizophrenia. They want to be British, but the British do not see them as British. In Britain, they say Paddy’s, use a lot of derogative terms and see them as Irish. As could be seen with the Brexit deal, last week Theresa May and Dominic Raab were quite prepared to ditch the DUP and the rest of unionism right across the 6 Counties to have an enhanced trade relationship with the EU. So, the unionists think they are British, but the British have no time for unionism in the 6 Counties. There was always a very small number of unionists in Britain who had a relationship with unionists in Ireland and that is where the whole Plantation of Ulster came from. But the ordinary people in England would not see the ordinary working-class unionist in the 6 Counties as British and would ditch them tomorrow. They are in a catch 22 situation. But we might have to be prepared to defend Irish nationalist areas from any incursion from loyalist in these areas. As night follows day, this will follow, and we will be up for that task. DR: Coming back from Brexit and the 6 Counties to Dublin. Particularly here in Dublin, you have the ongoing drug gangs feud. Not too long ago one member of the IRA, Michael Barr, was killed as a result of this feud. In newspaper articles from the 1990s, you were described as an anti-drugs activist, you were in “Concerned Families Against Drugs”. What role plays the anti-drugs activism in the Republican Movement and what role does the Republican Movement play in the anti-drugs activism. BK: My own involvement in anti-drugs activism was born out of the need to defend our areas from the scourge of heroin. The epidemic of heroin came in the early 1980s, then ebbed out and came back in the 1990s and has continued since then. I would have seen my involvement in the anti-drugs movement as a necessary thing to defend my own community from major drug dealers and also trying to protect those who were falling into the circles of drug dealers and becoming addicted. Myself, personally, I worked as a drugs counsellor for the health service executive in Ireland. That was the Dublin government’s help board. I worked with people affected by drugs, addicted to drugs. I see that as absolutely consistent with my attitude towards drugs. I have no time for drug dealing but I understand that particularly young people in socially deprived areas who do not see a future for themselves and who would have been denied standard education that everyone can benefit from. I was prepared to work daily with people affected by drugs and also looking at issues of rehabilitation and treatment and trying to reduce the impact of drugs on the individual. Saoradh is the same. We are republicans and we are against the scourge of drug dealing and the effects it has on working class communities but also rural communities. We have a much more involved attitude towards the reasons for the drugs scourge in Ireland. As regards to drug gangs. There is a feud, okay. But the feud is probably being controlled by a handful of people on the one side and a very small handful of people on the other side. It appears that there are massive numbers, that there are two drug gang armies, like a Mexican cartel or a Colombian cartel. But that is not the case in Ireland. There is a small number of people who are making a huge amount of money on the one side and a small number of people making a huge amount of money on the other side. What they are making is, they are basically using young people, drug addicts, as guns for hire. When these people are caught and go to prison, they are not supported by any drug cartel or any drug organisation. In most cases, they have nothing to gain from. The vast majority of the people involved in these feuds are just ordinary people, unfortunately, caught up in the drugs scourge and I have huge sympathy for all of them. The problem is that it is affecting everyday life here in Dublin. The Dublin government did not react to the drugs scourge until it became a major issue and that is why a couple of innocent people were shot. There was an innocent man shot in Spain and just recently a couple of hundred yards from here, near Connolly Station, there was another innocent man shot dead, again because he wore the same jacket as the intended target. When that happened, the government said they are kicking in. But I would say all the 20 people shot dead in this feud are victims of the policy of the 26 Counties government in relation to drug issues. People are caught with a small amount of Cannabis and given a conviction and that conviction means that they cannot get jobs, or they cannot travel to America, Canada or Australia. Young people who out of boredom or low self-esteem are using drugs, then find themselves ostracised by the state itself. And then when they are on drugs, the level of rehabilitation or treatment is virtually zero. So, they continue in a spiral of drug use and misuse and then they have no options but to get involved in the activities of drug gangs. Yes, there are two drug gangs involved in this feud, but the government has a huge part to play in this as well. Republicans are anti-drugs, anti-drugs gangs and against the selling of illegal drugs and the flooding of our communities with illegal drugs but we have an understanding that drugs do not start with the individual. They start with the social conditions that bring people towards a belief that they have no other escape but to use drugs. Like the Brexit document, I think later that year in 2019 we should have a very well-developed position paper on drugs in Ireland. All the people that died in the drugs feud in the past 2 years, every single one of them is a victim. Just because they might have been involved in a drugs gang does not mean it did not bring hardship to their families, their partners, their children, their parents and their siblings. The government have continuously failed in dealing with it and that is where the blame lies. DR: Brian Leeson from éirígí just launched his campaign for the local elections here in Dublin. You contested elections for Sinn Féin in the late 1990s. Will Saoradh contest future elections? BK: First of all, we are an abstentionist party. That means if elected we do not intend to take our seats in any of the partitionist parliaments of Stormont of Leinster House. Our constitution says that we would need to consider our request to stand in council elections and we will do that on a strategic basis. We are not rushing to become populist and to sell ourselves to the electorate just for a sniff of power. We have no intention of doing that. Currently, we have no intention of standing in any elections, but we will consider the possibility if and when this situation arises. The notion of standing in elections would not be just to get elected. If we consider standing in elections that will be a strategic overview of where a number of elected Saoradh representatives would fit into the wider Irish political scene. It would not be that, let us say an individual like yourself could be successful in one single constituency, that would not be justification enough for standing in elections. It has to fit into an overall socialist, anti-imperialist strategy. But the party will sit down and discuss it if this situation arises. DR: The majority of these prisoners is supported by the IRPWA but Saoradh has recently established their own POW Department which raised a few eyebrows among people. Has the relationship with the IRPWA and the role of the IRPWA changed? BK: People have said to me that there was a bit of confusion and I understand that. Anybody who wonders about that, I have no problem with that. What I would say to you is this. The IRPWA, and I am a member myself, is predominantly a welfare body to look after the interest of prisoners and their families. I do not want to put an emphasis on the financial part because finances are a very small part of the dependents of the republican prisoners, their families and their children. It is a welfare body and we do what we can to support the families in the difficult situations they find themselves in. The IRPWA as an organisation supports republican prisoners. The important thing about the IRPWA is that it supports any republican prisoners who find themselves in prison and is not supported by any particular organisation. You are either with the IRPWA or you are not with anybody and you seek support from the IRPWA. The IRPWA will support you but it is predominantly a welfare organisation. When Saoradh was established we felt that we need to develop a department within Saoradh to look at the other issues that would include policy issues in the jails, advice of people in court and so on. We would encourage prisoners to develop policies themselves. This might influence republicans outside and often it does. Some of the most insightful documents that we have seen in Irish republican history have developed inside the prisons and made it outside. So, Saoradh felt that there is a need of a specific POW Department that looks at policy between Saoradh as an organisation and republican prisoners who are aligned to Saoradh. It is not binding to anyone who is not in Saoradh. The IRPWA will still work on behalf of any republican prisoner who seeks their support and it will support the families regardless, even if the move away. Say, if a prisoner is aligned to Saoradh and he moves away ideologically from Saoradh, the IRPWA still has a responsibility to support his families and his dependents. The difference is that it is now more clearly identified as a welfare body while the POW Department has a responsibility to discuss policies with prisoners aligned to Saoradh. You heard it yourself, the whole debate and I understand it. Someone said to me: “Oh, you are ditching the whole IRPWA thing.” No, nothing of that sort. Most people in Saoradh are involved with the IRPWA and we will continue to do that. But you could be a supporter of the IRPWA and not necessarily a member of Saoradh. Within the IRPWA the ideology is not a mandate, you do not have to be of a particular persuasion to be in the IRPWA. DR: I am one of those who was surprised when I saw a statement from the Saoradh POW Department. BK: It is a necessary distinction because you cannot have a welfare body influencing the political decisions of the prisoners. Decisions are made in prison and they can have enormous implications. It is now very similar to the kind of POW Department Sinn Féin had many years ago when there were many prisoners inside. But there is no rift. If you are an independent republican no matter what ideology you have, you will have a right to seek support from the IRPWA and you and your family will be given support. There is no takeover or any attempt to dominate any organisation. DR: That brings me to the final two questions. How long will you be the chairperson of Saoradh? DR: No matter how long it will be. When you then stepping down, how should the organisation look like when you hand it over to your successor? BK: I would envision that the organisation gets more involved in major social and economic issues across Ireland that affect Irish people in all 32 Counties. We should be involved in more community groups, trade union movements, housing associations, anti-imperialist groups, we should be involved in campaigns like “Take back the city”, we should be standing beside the working class, unemployed people, people who suffer from the effects of the kind of society we are living in, people who are disadvantaged, disenfranchised. We should have encouraged more and more people to revisit our republican ideology. We should make huge strives to bring these people into the party, so we can harness their collective contribution and present it in a much more unified way. This is not a bigger party with more members but a more effective party, making real inroads into Irish political life and selling the idea of a revolutionary socialist Republic to the citizens around Ireland on a 32 Counties basis. New Saoradh mural in Newry, Co Down. As always with Dieter, a tight piece of work. Dieter has brought the margins into public discourse with an intellectual rigour not often seen. Brian came over very well. Hi DaithiD, you are right that there is a repetition in the interview because I didn't cut the interview and decided to transcribe and publish the whole interview. I don't have a word restriction on my blog like I would have in newspaper, and in this way, I people can see what Brian said without seeing through my lenses. “...They say its immigration and people coming into their country and stealing their jobs. It was the Tory policy that lost the people their jobs and gave people in the north of England a substandard life and fewer opportunities for work, housing and other services. It has nothing to do with immigration. It was the mismanagement of the British economy that causes the mindset. Britain has dug a hole for itself with this Brexit policy. I believe that the capitalist people in England were used against the people in the north of England. The people who hold the power are all in the south of England. So, the people reacted in a xenophobic way. Stuff like this isn’t down to not editing , is due to mis-editing surely? Or does Brian repeat himself throughout? It wouldn’t really matter if you were not quoting someone, it’s hard to see what order he said things in, great interview subject though. “...We have a desire and a need to produce policies and explain why imperialism is holding this country back. So, I would that by mid-2019 we should have a number of printed policies in place. At our recent Ard-Fheis, we decided to hold conferences in the early part of 2019 on a range of issues including homelessness, housing, drugs, the legalisation and decriminalisation of drugs, drug treatment and rehabilitation and a whole range of social issues. “...I remained in Sinn Féin for a couple of years afterwards but then I felt: What has since the Good Friday Agreement happened? Sinn Féin went into Stormont and also accepted the police informers and I felt that I no longer have views consistent with that ideology and I left. “...We realised that it is an anti-imperialist struggle that we are involved in and the Dublin government are very capitalist and imperialist in their makeup and unless we bring this notion to people and get them to understand that capitalism is the enemy of the people, we will go nowhere. This is the path we are going now. Last one as I don’t want to repeat myself too (!) and I can’t remember what I’ve found and posted prior, but you get the idea, I’m assuming he didn’t repeat himself verbatim in seemingly every answer. “...And this will happen again because it is unavoidable, and it will awaken nationalism again in Ireland. The British presence will be resisted, it just follows naturally. If we go back to the late 80s when Aidan McAnespie was shot dead as he crossed from Aughnacloy, County Tyrone, into Monaghan and he went through the border checkpoint there. He was a young GAA footballer and that would have been a normal thing for him to do going to football training. And then when he had a match on a Sunday, he physically had to walk a couple of hundred yards from the occupied 6 Counties to the 26 Counties. On a regular basis like many young people of his age, he would have been subjected to racist abuse, sectarian abuse, threats of violence, harassment. On the same day, he was shot dead, it was said that he got the same level of abuse. He was shot from the border post in the back and died. That was just an extreme version of what was going on for people of all ages. Ps when you mentioned blog i checked your out and see what happened, you have standalone quotes in the text which you have then repeated in the body of the article. DaithiD - well pointed out. That was TPQ's fault. Dieter had his end right. When formatting we lost the bold. Think it is all corrected now. Ah, DaithiD, now I see what you mean, and I think Anthony McIntyre also answered it. We use different programmes and on my own blog, I highlighted passages here and there, they come out as bold quotes, standing out of the transcript. Brian is not repeating himself all the time, these double quotations should be in separate boxes and not in the transcript.